There are a lot of bands which, though the music may be good, you can't take seriously based on the band name alone. I'm not saying Katatonia is a bad name, just that there are one too many metal bands that choose to spell their names differently because a 'k' looks harsher than a 'c'. That is, in my opinion, a shallow way of looking at it. I'll admit it. 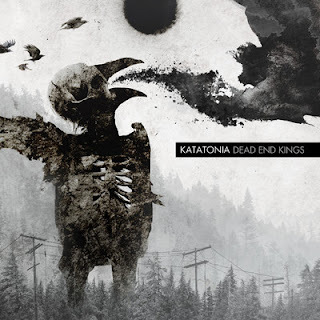 I never gave Katatonia a chance based on the fact that thier name starts with a 'k'. I also admit this is not a great way to start a blog entry. That's why I have moved it down further into the body of the text. See, I can be sneaky, just like Katatonia, whom most still deem as a metal band. Katatonia's roots are in progressive metal for sure. This band sounds in some ways like newer-era Dream Theater, just a little harder, or newer-era Amorphis, just not as heavy--or somewhere in between. The metal blogging universe has been talking about this album since news of its inception first hit. This is because Katatonia is a long-tenured and well-respected band no matter which way you slice it. I didn't realize that Niklas Sundin, from one of my favorite metal bands of all time, Dark Tranquillity, is part of Katatonia. The best way to descibe this Swedish band's newest batch of music is as a blend of modern progressive rock with occasional metallic riffs, soaked with dark, atmospheric melodies. Frontman Jonas Renkse lends plenty of fluid emotion to the mic, while beautifully strummed guitar melodies and an undercurrent of keyboard fill out the sound. Dead End Kings doesn't have a definite standout track, nor does it have any obvious filler material. Instead, what we have is 11 delicious cuts of prime progressive rock. This is yet another great album from a great band. You don't have to be a fan of metal to enjoy Dead End Kings. Bow to the majestic reign of Katatonia. You will not be disappointed. 4.7/5 stars. Lisen to First Prayer and Dead Letters below. Thanks for reading and enjoy! I like the band and their music, but I find it unusual that you choose to describe their music as delicious.